Library ELF is a services geared toward keeping track of what you’ve got checked out which will then keep you from getting charged a fine. 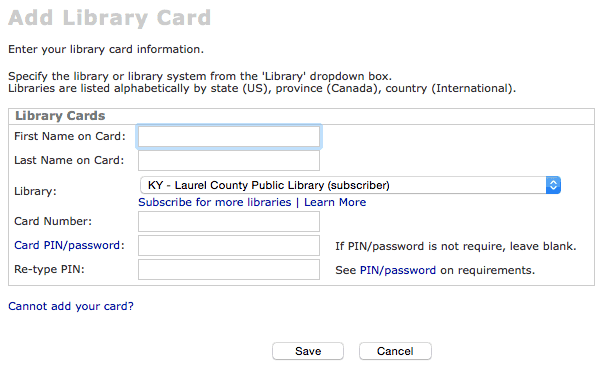 All you need is an email address, library card number, and your password used to log into our catalog system. Tip: If you’ve never changed it, by default it’s “1234”. Once you’ve added your card, you can add others in your family–VERY useful if you have children or a forgetful spouse that checks out books and doesn’t tell you about it. Your options are plentiful. Choose how long before an item is due to be notified and how you want to be alerted. 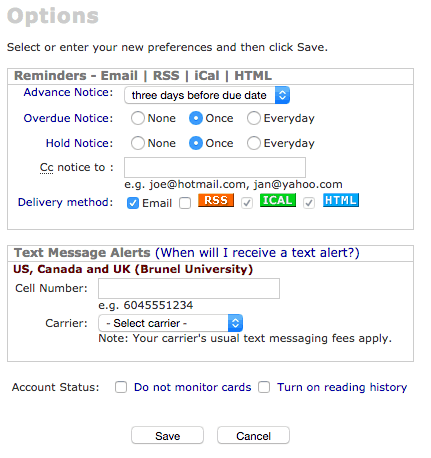 You can get alerts via SMS text messages or sent to multiple email accounts. You can also subscribe to your notification schedule via an iCal feed that can be subscribed to via your online calendar (like Google Calendar) and viewed in other places, like on your phone. You can have Library ELF send an alert that the item you’ve placed a request for is ready for pickup.